"Go West" Feral Woman: Happy Birthday, Mom. I miss you. 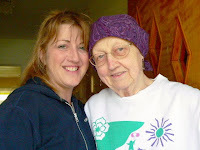 To carry on my mom's memory, I want to become her voice, what she would say to other women if she was here today - and so I try to do my best to let others know that if they have these symptoms; bloating, pelvic/abdomen pain, constant fullness/problems eating and/or frequent urination - DO NOT brush it off; please get it checked out ASAP. The earlier it is caught, the better the survival rate; but because this killer cancer's symptoms can be brushed off easily, misdiagnosed as a non-lethal illness, less then 20% are diagnosed early. IT IS IMPORTANT to tell women to keep seeking answers if they have not found the solution to their symptoms - dont give up! what I really wish for is just one more shopping afternoon trip with my mom.